It seems to be time for all good, bad and ugly men and women to come to the aid of the party. The provocation for this rising din of unified voices from manifold walks of TN life is the disturbing rise of one of the most hated characters in recent political history. Never has the mood of multitudes been so manifest and of such magnitude against one person: V.K.Sasikala. The very mention or memory of her name evokes a primal revulsion that bursts from the core to the surface in a jiffy. Yes, it is a bias, held jointly and severally by all and sundry, but the collective bias is founded on sound experience, personal and public, from this moment to every moment backward, with the momentum of anger picking up with everypassing moment. The udan pirava sahodhari, UPS, which term includes her grisly gang, is just, simply not what you, I and even our pet dog want. Anything, everything else is okay, for now. UPS’s benefactor J, all through her turbulent political career, alternated between fort and court. Elected four times, she however was a six-time CM because two of her stints saw judicial short-circuits and reinstatements, indeed a novelty of sorts. The jail-bail routine was of, for and by the UPS too, though the original sin of corruption charges lay at J’s doorstep, as she was the one in power. But J’s bigger sin was this lethal legacy she left behind despite having abundant foreknowledge of what the sinister sister and her scheming society was upto for long. The resident evil she nurtured in a strange shroud of secrecy has now emerged from the pit she now lies in to haunt the whole State. During J’s lifetime, none dare raise a finger against the UPS; But in the days following hospitalisation and the ‘formal declaration’ of death, the AIADMK seniors did have enough opportunities and even the Constitutional duty to raise questions on their leader’s physical and mental State. Yes, all those rebelling now are guilty of omissions and ‘commissions’ too. Having gone along with the charades since September last, no meditational dramatics or sudden solidarity can add credibility to the rebels’ belated bravado. Yet, better late than fatal. As we said earlier, the people and yes, their pets too, are ready for any alternative to the devil and its devious designs. The sense of dread is palpable. The SC is seen as an immediate source of succour. But a system of jurisprudence dependent heavily on evidence and arguments that can thwart truth and spirit has let many a high profile criminal slip through the pores. Indictment and acquittal are wholly ‘technical’ and a matter of arithmetic! Ask Mr. Kumaraswamy of Karnataka. The floor of the Assembly is the next stop for the disparate, desperate us, poor citizens of this cursed State. This is a classic case of voters vs voted reps. It is obvious that if the MLAs were to go to their constituencies and only check, not with people, but just the party cadre, they would realise the folly of falling in line with the squatter in Poes Garden now seeking to repeat the act in Secretariat. But for that to happen, they have to first get out of the luxury resort they are imprisoned in. The proof of the pudding of OPS’s charge of coercion is this mass hostage scenario. If the CM could be put under duress, what can cm’s, read common man’s, duly elected reps in captivity do? They also have to take into their ‘account’ suits and cases not of the legal kind. Suffice to say TN political class remained immune to the De-M drive and have prospered, rain or shine, flood or blood, old 1000 note or new 2000! Just when we were beginning to believe that permanently temporary OPS would be at least temporarily permanent, comes this distressing ‘damn’sel! Tsunami, deluges and droughts, and Vardah left a debilitating aftermath. But ominous forebodings and negative vibes augur a bigger disaster beforehand itself. Let’s muster all our rational and superstitious spirits and fervently wish this catastrophe will be somehow called off, judicially, Constitutionally or by any means. I am impatient to get back to the terrifying latenight teleserials. Those wily ghoulish characters with garish make-up and gleaming eyes in close-up seem like pleasant angels. Now, have I willy nilly given a title to the mother, no, make it ‘small-mother’ of all horror serials? OMG! 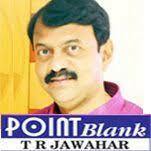 A chartered accountant and a cost accountant by qualification and a person of friendly disposition but someone who values his and others privacy, T R Jawahar was not cut out for journalism. But how Jawahar has ended up as one of the most prominent journalists in Chennai and the creator of some important big news brands at such a young age is the stuff of destiny and the dint of hard work. Born to that doyen of journalism and a legend in these parts, T R Ramaswamy, well known by the affectionate acronym TRR, Jawahar no doubted has inherited his analytical and writing skills from that great man. Apart from this, the father and son duo share another important quality that define their entire world-view, which is humanism. A warm empathy for all beings in the world is the core of their beings. After the passing away of TRR in the late 80s, T R Jawahar took over the helm of the Chennai’s most popular English eveninger, News Today, and seen it grow through both good and bad times. Through the unceasing publication of News Today, Jawahar is continuing the legacy of his father who founded the paper as a social commitment as well as an entrepreneurial venture. Jawahar further perpetuated the journalistic memory of his father by founding the popular Tamil eveninger Maalai Sudar. The two papers have carved a unique niche for themselves through an adroit mix of news and views, which help the readers to retain their Indian cultural identity. Apart from this, the biggest and the most path-breaking journalistic venture from Jawahar is Talk Media, that publication stable that has now become the talking point in the city with a slew of neighbourhood weeklies covering the length and breadth of Chennai. His Point Blank column in the Talk Media is hugely popular for its most forthright views conveyed in cheeky and witty manner. To discuss Jawahar just in journalistic terms would, however, amount to doing a huge disservice to his rounded personality. Endowed with a sunny sense of humour, Jawahar is a connoisseur of movies both in Tamil and English. He is a virtual treasure house of knowledge on Tamil film music and Tamil poetry. He is a history buff and a keen reader of English and Tamil works, which is counter-pointed by his fetish for modern gadgets. A willing traveller, he has brought to bear those varied experiences in his trips in India and abroad on his writings. Despite his professional achievements and his focussed administration of a company which employs over 500 people, Jawahar remains essentially a family man, a caring husband and a doting father. He derives his strength from his wife and daughter, and his home and office forever remain his temples.